So since I went shopping yesterday, I invited my friend around and made her dinner, to pay her back for cooking me dinner the other night. So alls been settled. It was fun hanging out with her for a few hours. We had rice and chicken and I did a little too much rice, so she couldn’t quite finish hers, but hey ho now I’ve got tomorrow’s dinner! But she was telling me all about her exploits with her men friends, as it seems a few males her competing for her attention, even though she’s not into any of them – unlucky fellahs. But after spending the evening with her, I now understand how they could have gotten the wrong vibes from her, she’s a very open personality, which can easily come across as wanting that sort of relationship, when all she’s looking for is friendship – I mean she’s not my type, so I don’t care, but other’s might think differently. It’s funny but it seems like most of the girls I’ve met aren’t looking for a relationship, while it seems like quite a few of the guys are, which is sort of change from the usual gender stereotype, about relationships, usual the male doesn’t want the relationship the the female does, although the university girls are proving this wrong. I’m also surprised about the number of people that have come to university attached, it just doesn’t seem like a good idea to me, I mean long distance is hard enough and then add freshers on top of that and it’s just a recipe for unfaithfulness. But all this talk of relationships, makes me think about my first and then things I could have done differently and I don’t like to think about that at the moment, it’s a small regret, which is a small price to pay for a wonderful memory. I decided to straighten my hair today for the first time in a long time now, I think it’s been a few month, although I think I did quite a good job, but this does mean that I’m going to have to wash my hair tomorrow most likely, due to the fact that my hair gets really greasy when it’s straight, compared to when it’s not, where it just gets tangled – greasy or tangled, usual I go with tangled. So because I was straightening my hair, I took a shower and the water was freezing. I’m not sure why, I thought it might be just because someone had used all the hot water or something, because apparently people have had that happen, but I was chatting to my house mate and she said that the shower was cold for her as well, so we think it might have something to do with what they were doing outside today, but honest we don’t know and I’m just hoping there will be hot water tomorrow. So tomorrow I’ve got this wine reception thing, which I’m really looking forward to, well I think I’m looking forward to the wine, but then I’m not really a wine person, although I did have this nice Rose wine once, but I’m thinking they will probably be serving the cheapest wine they could get their hands on. So there is this guy I’ve had my eye on, but like the majority of the time I see someone I might potential like my sadist side kicks in and starts to analyse and I’m not going to purse it – him. There’s a bunch of reasons why and he’s a nice guy – that being one of them – and he’s sweet – that being another – don’t get me wrong I’m not against nice guys, it’s just not the best thing for me, maybe in the future, but I find nice guys can be good one night stands, but I think I don’t want to have a one night stand with someone that lives about 5 doors down from me and who I will probably see nearly everyday and what not. What would you do on the clock? So way back when, I used to have this little… habit of asking people – my friends mostly – if they had a certain amount of time to live, would they change their lives and how? So people usual gave the generic, I’m not sure and then offer a simple answer when prompted, something along the lines of spending time with the family or doing that one things they always wanted to. And recently I’ve been thinking about it again, but I also now wonder, would people actual do the things they said they would, or would they just keep going on the way they have been and I want to test this out, but then I’m not sure how and of course I need some people to test it on, a little experiment for the future me. Although some things I don’t think I could get people to do, because by the end of it they would be completely broke and have to live in a tent, like apparently one of lecturers did for the first year of university, because he didn’t want to pay to live in halls or anything like that. He doesn’t recommend it though, so I’m glade I didn’t think of that way of saving money. I was thinking one night stands, but that involves knowing where I’m going and not getting too drunk, two things I’m not super constant on when I go out. The group I go out with all get pretty drunk and it’s the sort of group where – most of the time – if you’re not drunk-ish, then they’re not as fun to hang out with, as when you’re also drunk-ish at least. I haven’t really been hanging out with the last couple nights, I mean I mean to sometimes and then just end up not, but I do need to get my hoody back, I was hoping to see her sometime in the day, but no luck, maybe tomorrow. It would be nice if I knew where she lived so I could just go over, but I’m not sure what number it is, so yeah. I’m not really the sort of person to go around knocking on people’s doors until I find the right one, because I will probably have to go around the entire student village and then not actual go to her house at all – I just have that sort of luck with these things. But hey ho the worlds still turning and it’s not like that’s my only outerwear, just my favourite. I’ve been trying to keep on top of my spending and have been doing pretty well so far, but I don’t know how long that is going to last, although I think I can see a statement online, so if I do loose track I can get back to date from there, but the online banking for my new bank has a weird set up and I don’t really understand it very well, but I suppose I’ll get used to it – in the end. So I went searching for the author of this quote, because I thought I knew who wrote it. I was wrong, apparently the true author is unknown, but wrote it for a card and got paid next to nothing for it. So since I went shopping with a friend today, in between lessons, since we had a 3 hour gap, so we grabbed lunch and went food shopping. I now actually have food, which means I can repay my friend for cooking me dinner, by cooking her dinner. I’m thinking I’ll text her tomorrow, asking if she wants dinner tomorrow evening. Since I have another free day tomorrow and then again Friday – I’ve got such a free week – I’m going to straighten my hair tomorrow, look how out of control I am, straightening my hair on my day off – whoo! I was planning my week around my friends visit, but she couldn’t get this weekend off, so she’s coming down on the 11th October, instead I’m just hoping that I don’t have any assignments to finish that weekend, because I have a lecture 9 o’clock on Monday ever week, so it seems Sunday will be my day of rest for this semester at the very least. I’m quite looking forward to her coming down, because I’ll be able to show off my amazing university life to her – oh wait it’s basically like my old life, with new people and a new place, oh well, she doesn’t have to know that, she’s only coming for one night. I’ve been trying to write again, although the noise outside has been distracting and I’ve not got much inspiration, as the seaside was less inspirational that I was hoping, but maybe that’s because I went to the busy commercialised bit or something and a less busy bit might be more inspirational, but I did get inspired by my shisha at one point, so I’ve written 2 short stories and am working on another, which I think is pretty good going and all that jazz, since I haven’t actually written in a while, but I think short stories are best for now. So if you had say 10 hours left to live what would you do? So today was quite a dull day to be honest, I didn’t do all that much in the morning and since I didn’t have anywhere to be or anything, I just chilled mostly. I did catch up on the TV I had missed which was… fun… Or something to that effect. Due to the player stopping ever few minuets at the end of each episode – wonderful moments of waiting. But I suppose I’m going to have to learn to live with the bad wifi around here, as that’s all I have. So yeah I did go with one of my house mates to this curry night, which was a bit of a let down to be honest, as they gave use tiny amounts of curry. But we met some nice people there, which was… nice and played some pool, at which I am still just as terrible. Me and this girl where playing, after my house-mate and the other guy there finished and we were both as bad as each other, although I as winning at one point, but most of the time I was loosing, which was a little down heartening, as she had never played pool before, but I have, not that that seemed to help in the slightest. So we didn’t actually finish the game, as they had to leave, to get their last bus. So me and my house mate finished the game and then came back, another night in me thinks, although last night I did go over to a friends place, but that was it really. I’ve got to get up in the morning, then there’s the crippling gutted sensation I’ve got at the moment, which really isn’t permitting going over to the big congregaters – as I will probably from now on be calling them – and joining in on their night antics, not that I don’t want to and if I had some booze, I’d be out there right now, but the shyness sets in and then I’ve got the whole early morning, so I can’t stay out long, although I really need to get my stuff back from people, so maybe tomorrow night, although there might not be something on tomorrow night and I do want to wear my BU top – as I did spend a bit of time customizing it, by cutting it up and all that jazz, mainly because I was bored at the time and didn’t want to disturb house 3. Although if it was a little earlier right now I would go over there and just disturb them, but I think it’s a little late for that, perhaps tomorrow, after my lessons – lectures or session or whatever it is that I have tomorrow – I’ll go over there and disturb them, although I think I have a free day Wednesday, so I might see about booze and going out. But it is important that I get my hoody back at some point in the next few days, although I don’t know when I’ll see her again, so yeah. I’ve also got £2 for someone and a wristband to get back, so there’s some things I need to do. Fortunately it’s nothing more than that, but from now on if someone asks for a hoody I’m giving them the one I don’t like very much, so if this happens I don’t have to worry about getting it back. I like that hoody, even if I did technically steal it off of someone else, don’t remember who. Probably why I like it so much, I do like wearing other people’s clothing. So any ways the latest Dr. Who episodes… I’m still not sure if I actually like the new stuff, don’t get me wrong it’s interesting and all that jazz, but yeah I’m still on the fence about that one and then I’m still not sure if I like the new doctor, but then I suppose I got used to the others and all that jazz, although that strange woman hasn’t been in the last couple episodes, so I’m wondering what’s going to happen with her. 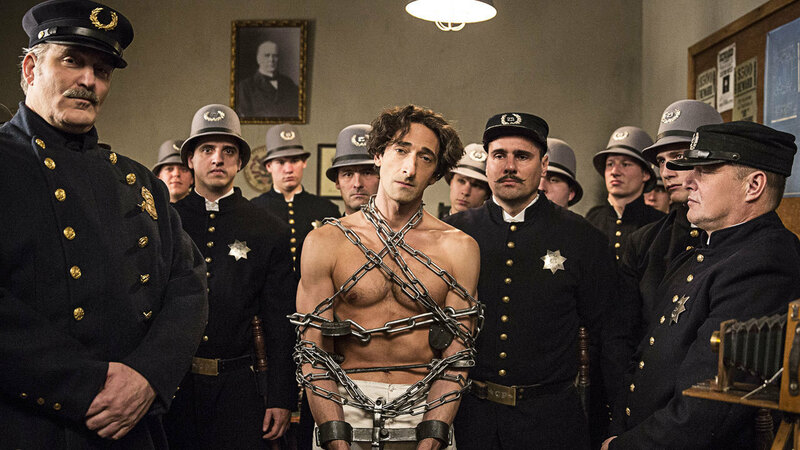 I also finished that Houdini thing that was on, which I thought was good, although it does sort of spoil Houdini for me, but not in a super bad way. Although I thought that he didn’t pull off the elephant trick, that it only worked for half the audience and not everyone, or was that someone else who tried to make an elephant disappear? Perhaps someone copying Houdini, or did I just get bad information or something? I think it would be cool to be an escape artist, although I don’t think I have the discipline for it myself. The sleepiness will never fade..? So today has been on of those day where I wake up in the morning thinking, ‘I’m going to do this today’ and by the time I’ve got dressed and showered and eaten breakfast and all that jazz, I’m thinking I’ll just do this before that and slowly I end up doing other things and not the things I set out to do when I woke up. So I’ve been terribly tired today, so I haven’t actually done very much and seeing as I’m still terribly tired, even after eating dinner – bowl of rice, as I was going to eggy bread but the bread was mouldy – I still don’t feel like I could walk anywhere further than the kitchen or perhaps just outside the front door, I’m thinking I might stay in tonight and seeing as the usual people I go out with, have desisted with they’re congregating outside, I’m thinking I won’t be going out tonight any ways, unless I went a knocked on every ones doors and annoyed them all to bits. There’s think thing on tomorrow that I’m thinking about going to, since it’s cheap and right around the corner, so I don’t have to worry about getting stranded – again. And I think someone from my psychology class, who I’ve made a fast friendship with – mainly due to the fact she’s the only one I remembered was in my group, so was the only one I could text asking about the room number the first day and she’s a cool girl – is going to go, since it’s a student village and uni-let party and she’s in uni-let, so I think her house mates might come as well, which will be nice to meet new people. I’m also thinking about going over to my buddies house and bugging a girl from there to come with me as well, as we kind of became friends, but it’s sort of been a little while and I’m uncertain about her feelings toward me really. It seems that I will have to become accustomed to waking up early, because something always wakes me up at 6 something or other at the latest 7 and then I find it quite hard to get back to sleep, due to my stomach realising actually it wants some food in it and then I get up and dressed and after that I just end up taking sort of cat naps during the day, but then today I’ve been completely tired, but been having trouble with the whole cat napping and just ended up reading and all that jazz. So I wasn’t intending to go out last night and now I regretting that I did, since I spent both mine and someone else’s money going from my place to the club and then just straight back to mine again, as I had absolutely nothing on me, bar my key to my house. I didn’t think I would need anything else due to the fact I wasn’t really intending to go out with the others and just have a few drinks with them before hitting the hay, which is pretty much what happened. Although I’m sort of glade I didn’t get in, because I’m sure I would be completely out of it today, if I had stayed out last night, considering I’m feeling kind of funky this morning and all I really want to do it sleep. But it was an experience, although I don’t think I would have gotten back if I hadn’t been slightly drunk, but then I probably wouldn’t have been in that situation if I hadn’t been slightly drunk. I probably would have had my stuff or not gone at all. So after scavenging some some money off people for the bus – low moment in my life right. It should have been then that I should have told myself to go home, but by then the booze where leading me around – I chatted with a couple guys on the bus, which was nice and all that jazz. And then ran around the street trying to get back to the university, after being turned away at the club, where I gave someone my wrist band so they could get in cheaper – aren’t I a nice person. See I don’t think I would have been able to get a taxi like I did and get back to my place, if I hadn’t been a little drunk, but then if I hadn’t been a little drunk I don’t think I would have gotten on that bus, with only my house keys in my pocket and nothing else. I think I would have gone and got myself at least my purse or ID, but no a drunk me in an irresponsible me apparently. But like I said this is one experience that will follow me and make sure it doesn’t happen again. Like perhaps tonight, if I decide to go out tonight. But I might go shopping this afternoon sometime and buy myself something to drink and all that jazz and also something to eat, like something a little more than just rice and pasta. Which is basically what I’ve been living on for the past week now. But then I’m still really tired, so I don’t really wanted to walk all the way to Aldi, since that is the only supermarket I know how to find, although I might do what a bunch of other people seem to be doing and that’s having their groceries delivered, but that would mean having to wait until Monday for them to come and I want some stuff today, so I might just push myself and go for it, after another nap or two to get my strength up. Quote/saying of the day: Bad decisions make great stories – unknown. It seems like I ended up handing around my shisha to everyone last night, as most people didn’t seem to have ever seen one before or they were doing tricks with it or people just wanted to try and taste. But it seems every time I get it out people are all over it, but I think if I do again they won’t be because they’ve already seen it and everything. Although someone asked me to blow smoke rings and I just couldn’t do it, which was a little annoying, because I have been doing it fine these last couple of weeks or however long it has been since I learnt to blow them. So I’ve been trying to sort out my week – next week. As to what I’ve got free and what I haven’t got free and all that jazz. Since I’m still not 100% sure if I friend is going to be able to come down here, although I hope she does, because it will be nice to see her and all that jazz and I think she’ll like it here, since it’s… more than where I used to live and they’ll be some stuff going on when she’s here I think, so that’ll be good. My group managed to get our entire study finished today, so that was good, although I felt like I wasn’t doing as much as I should have been, but hey ho the world still spinning… right? So about halfway through our second ‘data gathering’ session, which for us, was just writing up our poster, I had to go to a lecture thing on all the different aspects of the student village – where I now live. It was pretty basic stuff about fire safety and about not annoying our neighbours and respecting the officer when you’re drunk and he’s trying to get you to do something, that when you’re you don’t want to do all that sort of basic stuff, although I did see a couple people who I might need to talk to and all that jazz, so that was good. After the ‘lecture’, I went into town with my house mate and his friend – the house mate who is 30. And we wandered around a little and all that jazz and I got to know Bournemouth a little better, so I think I’ll be able to pick my friend up next week from the train station. It was fun, although the house mates friend got me a drink and being me I got a little hyper and somehow more tipsy than usual, but it was interesting and also being me, by the time we were sitting waiting for the bus to arrive, I was thinking about making out with him, but understanding what a bad idea that would be, I didn’t, as I think he’s getting married soon and all that jazz. So after arriving back at the University campus I met up with a friend from psychology and we went to the uni bar to watch drunk people sing karaoke, since neither of us were up for it. I mean I would have been after a few – hundred – more rum and cokes – because that’s what I decided I was drinking today. But she had to go early due to the buses not running late to where she lived, as she lived in one of the uni-let houses, so we left quite early into the singing, as people had actually bothered to go up and sing and some good songs as well. But then on the way back to my place, I ran into some people from outside house 50 and they wanted me to go back there with them, but I thought ‘I’ve got to get up early tomorrow, let’s hang out with them tomorrow’, because my group finish our study today, we don’t have to go in Monday, so I can just go out all weekend and that will be great, I also have next Friday off, but then my friend might be coming down next Saturday, so I don’t want to get too drunk Friday night, but I can Thursday and then take Friday off and then go out with her Saturday, as I have now got my student loan – yay! – I can actually spend money now and more or less not have to worry, too much. Although I have to remember what I have spent so I can make sure I don’t spend over my weekly allowance, as I’ve still got to go and buy some more food and what not, as I’ve got to cook for my friend when she comes down and cook dinner for my other friend some time soon, because she cooked for me, so it’s only fair there. So I’m slightly off my face right now, but I feel that isn’t entirely my fault. I mean I got home, after having a day of going over to house 3 to pick up my new buddy, only to turn up late to something we really didn’t need to attend, but this was after seeing him half naked, honestly not something someone wants to see first thing in the morning, or even first thing in the afternoon, but hey ho the worlds still turning and all that jazz, right? So after being late to the first induction, that we actually didn’t need to be there for – and we weren’t so it doesn’t matter now – we had our psychology introduction, were I found out my class group, finally, couldn’t find out what that was before, because I couldn’t find the things, which made finding out my timetable kind of difficult. But the people I met in my class group seem pretty nice, but they were all girls and I’m wondering if we even have a guy in our class group or not. It seems that psychology is mainly female dominated, as it looked about 80 to 20% female, male in the room today, but who knows if that was everyone, as my buddy didn’t even know it was on today. I’m glade I met my buddy, as I have become quite good friends with the people in his house, mainly because I go over there often, as my house is usually quite dull, as the guy downstairs, still has yet to have a proper conversation with me and the guy upstairs has taken to calling me beautiful and other such pet names, which I find a little odd, as I’ve not really been around people that do that, so quickly after meeting someone – it’s only been about a day or so since we first actually met. But I’m getting used to it, I think. So today was alright, I didn’t hang out with the people who congregate in front of house 50, at all and I think they’re all gone now, to some party or other, but I did hang out with house 3 people, although not all of them, just three of them. And we had a few drinks, I’m just hoping I can get up tomorrow to go to my first class group lesson thing, but that’s at 11:30, although I want to get a shower in the morning, so I want to get up by 10 ish sort of time, because I usually take about 20 minuets to shower and dry and then my hair has to dry, since I air dry it and all that jazz, but since I’ve met some people from my class group I think I’ll be alright, although unfortunately none of them live in the student village like me, so I’ll be wandering there by myself. Although we headed there today, so we would know were we were going and all that jazz and I’m hoping I can find it again, I know roughly where it is and that will help in the long run, because I have a feeling most of my lessons are around there, although I’m hoping someone in my class group will turn out to live in the student village and we can head there together the next time – a girl can dream can’t she? I’m not really looking for love love right now, just someone to hang out with, so maybe a f*ck buddy or something, because after my exploits of the other week – although the aftermath wasn’t nice – I don’t think becoming emotionally attached is my deal right now. Let’s play it like a dude and play the field a little. Although there is this guy that hang out with the house 50 group and he’s completely my type, although I’m not too sure if he’s into me, but I’m going to dress in my usually sluttiness one night and get plastered and use my womanly wilds on him, so let’s cross our fingers for victory or something like that. So I made it to University – yay go me! It’s been different… to say the least. I mean I’ve settled into my room alright, but I’ve yet to really make friends with my house mates, apart from the one down stairs who seems either shy or just doesn’t like me for some reason, they all seem like really nice people. The other girl living with me, already seems to have friends in the student village, so I think she knew them before or something. So the first night I come back and the house is empty, dark and completely silent. So I’m sitting in my room reading, because I don’t have anything else to do and then I hear people outside and I think I’m never going to get to know people unless I put myself out there, so I do and I meet these two girls on the way back from talking to this taxi guy and they invite me to go around to their house, so I’m like yay some people to hang out with. So I go to their house, which is basically next door to mine and they handing me drinks, so I get pretty drunk and I’m very chatty when I’m drunk, which I think is a good thing. So they’re all going to the Old fire station, for the first night party that’s going on there. So I decide to go with them, well they asked if I wanted to come and being drunk off my face I was all up for it. So we all – well most of us – headed for the Old fire station in taxis. And once we got in people were buying drinks for me and we were all dancing together and I got a friend request from one girl in the group. So it was really fun and I had a good time. Although the next day I regretted drinking so much. I spent most of yesterday morning throwing up and sleeping, so yeah that was fun. But then I was hanging out with them again last night and most people had tickets to BIC, so everyone was asking everyone else, where they were going and most people were replying BIC, although some people weren’t coming out at all – again. But due to the night before and the morning after, I didn’t really drink very much especial because I had to get up for 9 this morning to do to my enrolment thing. So instead to taking taxis this time we all piled into into the local bus and it seemed like most of the student village was going with us, so being at the back I didn’t think I was going to get a seat, but I did, although if I had been drinking as heavily as some people I probably wouldn’t have minded very much. But I was pretty much sober by this point. So we got there somehow without getting off at the wrong stop. And as it turned out one of the girls – a really nice Spanish girl – had forgotten her ticket and so she had to pay to get in for something she had already paid for, which she was of course upset about. But we all got in and it was a huge place. There were three parties going on that night, but I think this one was meant to be the main one. For freshers. At some point during the night me and a couple other girls, went off to look for a cash point. I really just went to get away from with guy who was grinding on me and it was alright at first, but then I wasn’t really into it after a little while. So I just wanted to get away from him. So I went with them and we ended up going right into the city to find a cash machine, because the closer ones didn’t work. So we went for a nice long walk around. And the two girls I was with were really quite drunk and they both began to need the toilet on the way back, so they went in this private parking lot, while I just stood around, not wanted to leave them because they would probably not be able to make it back, so I waited for them. But it was a fun night. Every time we headed out onto the dance floor we would make this circle and then we got loads of people doing different dances in the circle, usual one or two at the time, but because I was so sober at this point I managed to keep myself out of the middle, somehow. But if I had been drinking I think I wouldn’t have, but it was all good fun and I sort of met some new people. I mean I met some new people while we were all standing around outside before we headed off. Although we moved these benches so we could sit on them, because the railing people were sitting on wasn’t at all comfortable, so yeah I while sitting there I somehow got the nickname Chester, don’t know how that happened. So this guy called me it on the bus, so I said I was going to call him Bilbo all night, but then he said he was a Hobbit fan, so that didn’t quite work out to plan. But so far, I think I’ve had a mixture of good and bad times, overall. I mean hanging out in the house by myself was a little boring and super dull and the morning after with the throwing up is something to be avoided, but other than those two small events I think it’s been alright. So today I had my enrolment, so I went over to my buddies house to pick him up, so we could go together, so I’ve now met my buddy and he’s allergic to grass, which I think is just a little weird, but apparently his father is allergic to trees or something like that, so yeah interesting family. He also stated that he’s not much of a party person, which is a sham, because I sort of am. Tonight there’s meant to be another party and we’re meant to wear these t-shirts to represent where we’re living, so the student village is black and white, which suits me just fine and other places are other colours. But until later, when I’m guessing people will probably start conjugating around house 50 again, since they have the last two nights, which is great for me, because I just wander over and they give me drink, although I did bring half a bottle of vodka and some strawberry and cream stuff, which is bright pink, so I might drink that tonight, maybe before I go over there, as that way I’ll be more outgoing and what not and more drunk, so I won’t have to pay to drink as much, because I haven’t got my student finance money yet, although I was suppose to get it today, hopefully tomorrow and I’ve only got a little bit left in the bank, but I went food shopping – sort of – with my buddy today, so I think I’ll be alright.